Use of internet technologies, including social networking sites and email, do not differ markedly between Hispanic teens ages 16 and 17 and teens of the same age in the non-Hispanic population. Some 28% of Hispanics report that they use social networking sites such as Facebook or MySpace daily to communicate with their friends, compared with 31% of the non-Hispanic population of the same age. Email use is similarly low for both groups—9% of Latino teens ages 16 and 17 use email daily to communicate with their friends, as do 11% of comparable non-Hispanic youths. Notable differences are apparent when looking at the use of more traditional methods of socializing with friends. While just 21% of Latinos ages 16 and 17 report that they spend time in person with their friends outside of school or work daily, for the non-Hispanic youth population ages 16 and 17 this share reaches 33%. 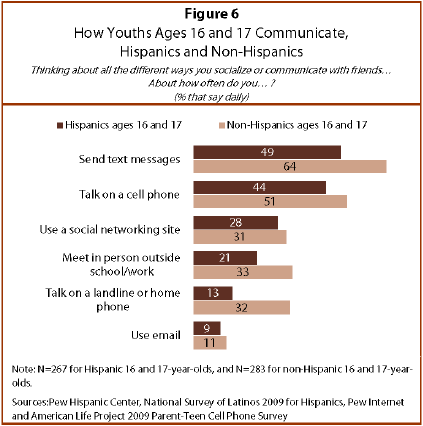 And while only 13% of Latinos ages 16 and 17 use a landline or home phone daily to maintain contact with friends, almost one-third (32%) of non-Hispanic youths of the same age say they do so.